Alessio always had a passion for the tourism world, and this passion is what brought him to decide to increase his knowledge not only of the world but above all, of his homeland, Italy. After receiving a degree in Tourism Economy, he decided to head out and take on a working experience in UK before returning to Italy to attend the MIB, school of Management and obtaining the International Master in Tourism & Leisure. After quite a few years of studying and travelling throughout Italy, Alessio decided it was time to begin his professional career working for one of the best Destination Specialists where he learned the ropes. 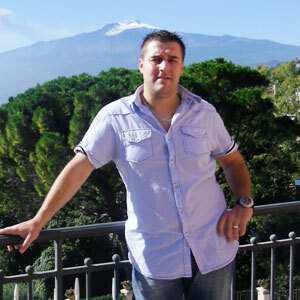 He put his knowledge into creating amazing off shore excursions to the major ports of Italy, assisting clients during their vacation 24/7 to then become Groups Executive before deciding to start his own successful business together with Frances.